This is the 2007 Danish paperback edition of The Wailing Wind, published by KLIM in Århus, Denmark. The text was translated into Danish by Søren K. Barsøe. 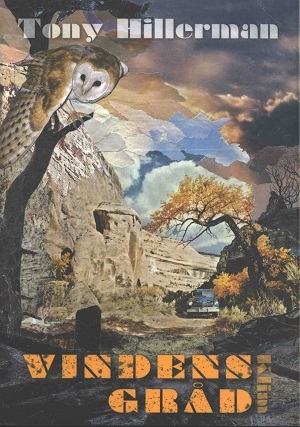 The cover was designed by Nils-Ole Lund and depicts a blue truck on a dirt road next to a sandstone cliff wall. In the foreground an owl is sitting on a branch. The fold out at the front of the book contain quotes from the press praising Hillerman's Navajo series. The foldout at the back of the book contains a brief biography of Tony Hillerman. There is also a picture of the author by Kelly Campbell. Format: Paperback, 22.4 x 15.7 cm. Binding: Paper covers with full color illustration. The title and author's name are printed vertically with the publisher printed horizontally on the spine.